Driving at night is much more dangerous than driving during daylight hours. You’re three times more likely to be involved in a fatal accident after the sun goes down. To stay safe, extra caution is required when driving at night. 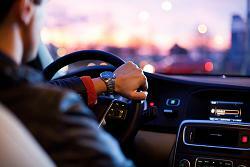 Below are examples of things you can do to become a better night driver. Be visible. It’s harder to see at night, so make sure others can see you. Turn your lights on before sunset, and leave them on after sunrise for those dangerous twilight hours. And make sure all of your exterior lights are functioning correctly. Slow down. You won’t see obstacles or turns at night until you’re relatively close to them. Driving slower reduces your stopping distance and increases the amount of time between seeing an obstacle and catching up to it. Adjust your mirrors. Use the nighttime setting on your rear-view mirror, and change the angle of your outside mirrors if they’re producing glare from the headlights behind you. Clean your windows. Water spots or dirt on the windshield become much more visible in the glare from headlights or streetlights. Clean your lights. Dirt on or in your headlights or taillights causes them to be dim and provide less visibility. Limit interior lighting. You do need to see your instrument panel and any controls. But the darker your car is inside, the better you can see what’s outside. Be alert. Drowsy driving is distracted driving and one of the reasons why driving at night is more dangerous. Scan for obstacles. Always be on the lookout for potential hazards at the far limits of your headlights’ beams. The crash-avoidance systems in some cars can help alert you to unseen obstacles, especially those hidden in the dark behind or beside your vehicle. Some cars are better for driving at night than others, with greater visibility and options such as adaptive headlights. You can find a newer, safer car with flexible leasing terms by searching our selection of lease transfers. If you have questions about the lease transfer process, please contact us at Swapalease.com. This entry was posted in Car Safety, Driving Tips and tagged crash avoidance technology, distracted driving, lease transfers, night driving, reduce speed, safe driving by admin. Bookmark the permalink.